We have been making business cards for the last 30 years! anywhere from hundred to a few thousand cards a day, what can I say – we are pretty great at it. We have many options, finished and styles to suit all budgets & tastes. With no minimum order the options endless, but don’t worry we are here to help! Flick through below and see what grabs you! These cards are economical, fast and look great. Digitally or Offset printed depending on how fast you need them & how many you want, this is great option for everyone and will get you some great cards at a great price. Feel great with environmentally friendly business cards. Digitally Printed onto a Kraft or Ecostar paper, these cards give you the recycled look that many business and people love. Ecostar 350gsm Stock – 100% Post consumer recycled stock with a great feel and look. Easy to predict colour as its a bright white stock. Buffalo or Kraft stock. This stock has a distinct look and feel to to it. The brown colour makes colour hard to predict but when dark colours are used the results can be spectacular. Other stocks – we have a small range of recycled other stocks that may suit you needs. Call and ask, you may be surprised. Add a Raised UV spot to add a third dimension to a 2D surface. All UV spots have be added to a laminated surface. We have some great new tech that can keep the cost of entry of this traditionally expensive process to a bare minimum. Want to really stand out, but don’t want to totally break the bank? Well a die cut business card might be just the ticket. With our fancy new equipment what was once traditionally very, very expensive for small runs, is now very possible and very affordable. Small quantities are no problem – 50, 100, 250! Small quantities are no problem in most cases – 50, 100, 250! Sometimes the simple effects are the best! Round Cornering cards is no problem and the process is quick, economical and looks great. Laminate (or Cello) Glaze– Laminated cards hold up well against wear and tear. They are a sustainable option for cards that you would like to keep around for a while. The Laminate adds thickness, bulk, feel to the card with Matt Laminates being our most popular finish. Traditional Embossed or Business cards are still very popular despite the abundance of new embellishment technology. Your card can be stamped with a gold, silver or any colour foil you would like. The foil is highly reflective and gives a look nothing like nothing else can. We can do Heavyweight Business Cards which is 450gsm Stock plus a velvet laminate which makes for a a very hefty card with a great feel. The laminate adds extra bulk and strength to the card which really makes it look and feel great. Cost difference is minimal so ask today. Don’t forget to add 2mm of bleed to each edge. Print quality PDF is the best format to use for business cards. With so many businesses in Melbourne and new ones starting up constantly, it’s more important than ever to set your Melbourne business apart. It’s not enough to simply be friendly with potential customers; its not even enough to provide them with your services once in the hopes that they will return. To truly make a lasting impression that ensures success for your company, you must give customers something to remember you by– and a business card is the perfect way to do so. Business cards may be small, but they can pack a lot of information when designed correctly and intelligently. Perhaps you would like a more sleek, minimalist card with very few embellishments. Or maybe you want something lively and exciting with lots of detail and shine. Either way, we can provide professional business card printing that is perfect for your company. No matter where in Melbourne you are located nor what kind of business you run, business cards from Classic Colour Copying are a non-negotiable asset. Business cards are a convenient way to communicate your services to potential customers. They provide clear and quick contact information. They are an extension of your company’s brand. Business cards are light and highly portable. Most importantly, they remind customers and clients that your business exists long after they ever meet you in person. That’s why it’s so important to design cards that communicate your Melbourne business’ unique style, tone and branding. Consistency in your company colour scheme, logo and taglines across all platforms (including your website, social media channels and, of course, business cards) will help you maintain professionality and clout. Here at Classic Colour Copying, we provide several types of business cards for both independent merchants as well as companies of any size. All of our business cards are customisable to suit your needs and preferences. They can be printed on one or two sides and personalised with a variety of features. We use the latest technology to create our bespoke business cards for professionals all over Melbourne and surrounding areas. One major way that our clients like to customise their personal business cards is by printing them with a unique finish. While a standard paper card is fine by most people’s standards, a card printed on high-quality stock with a bit of shine really boosts it to the next level. Choosing which business card finish is right for you is largely up to personal preference. That being said, there are pros and cons to each variation, which our friendly and helpful staff would be happy to discuss with you when you place your order. In addition to our finishes, we offer a range of other made-to-order elements that you can use to spice up your laminate, matte, gloss or velvet business cards. We have features available that can change their shape, texture or design if desired. Our cards are affordable and our service is swift! When you place an order with Classic Colour Copying, you are guaranteed competitive prices and a commitment to customer satisfaction. Our prices will vary depending on the quality of card you choose and embellishments you add– Feel free to contact our experienced staff at 03 9349 1199 for a free quote on your custom business cards! In addition to your fair rates, we promise efficient turnaround so that you can receive your custom cards as soon as possible and start seeing your business thrive! We can provide you with cards for one-off events that you are participating in, such as markets, shows, special functions or expos. If you are interested in establishing an ongoing relationship with us where you order cards as needed, we are happy to set that up as well. We are happy to provide whatever type of cards you need in any amount necessary. So contact us today to discuss your options and place your order for customised business cards in Melbourne! Call us at 03 9349 1199 to place your order! 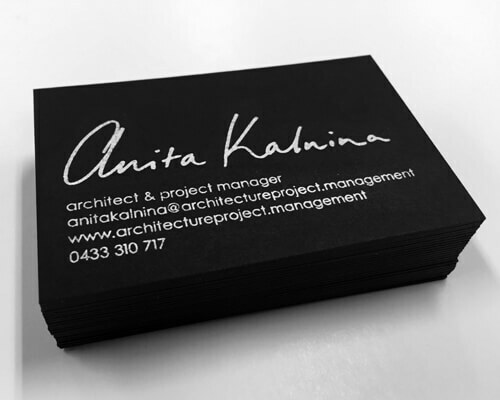 Are you looking for Express & Premium Business Cards in Melbourne? Classic Colour Copying is Melbourne’s number 1 choice for digital & sign printing, operating from the CBD with more than 30 years experience. With delivery free for CBD customers, it’s an obvious choice. Call us now on (03) 9349 1199 to place your order, or you can fill out our contact form if you would like some more information. Are you looking for Business Cards in Melbourne?